Hair truly is an amazing thing! It is one of our most distinct visual characteristics and presents in an incredible amount of diverse presentations. The field of hair medicine uses specific terminology to accurately describe hair. In this article today we present a primer on all the salient characteristics of hair. 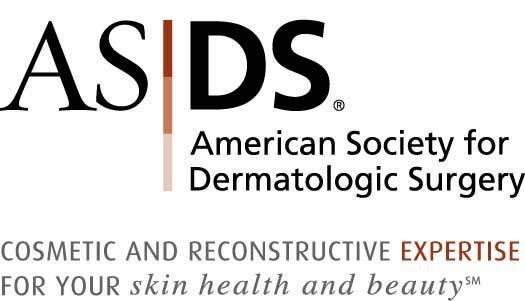 This article will help you understand the information provided by your dermatologist or hair restoration surgeon. The follicle is a mini organ that contains various structures (Figure 1). It contains a hair fibre growing from a hair bulb. The hair bulb contains the living, dividing, cells that mature and die forming the hair fibre. The hair fibre resides in a pocket of skin called the root sheath that is made up of several different layers of cells. The root sheath is attached to a muscle called the arrector pili which is responsible for making the hair stand straight when stimulated by cold or fright. Working our way up the root sheath we see the sebaceous gland which produces sebum, an oily substance that help the hair maintain its moisture and lubricates against other hair and the environment. Hair conditioners act to artificially replace the sebum that we continuously wash out of our hair. The follicle is considered a mini organ. 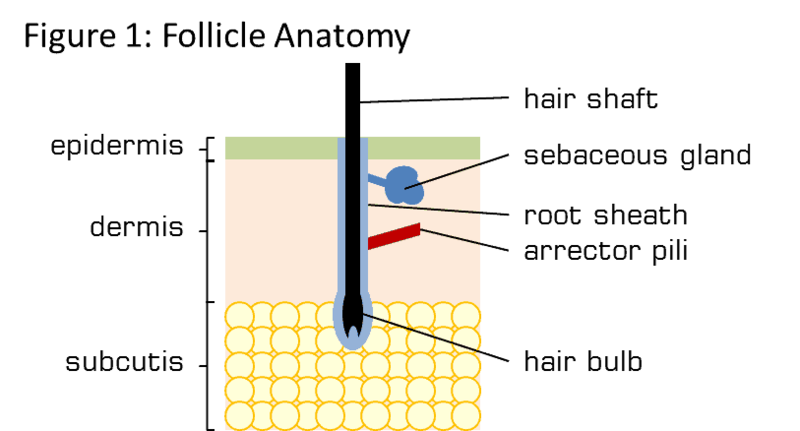 Follicles tend to live in groups called follicular units where multiple hairs exit the skin from the same pore or very close together from different pores (Figure 2). Follicular units can contain 1-4 hairs and even up to 7 hairs in rare instances. The hair count of follicular units tends to increase within the hair away from the hair line. That is to say that the follicular units on top of your head contain more hairs per unit than the follicular units on your hairline which contain usually 1-2. Hair restoration surgeons are very aware of this when they restore a hairline. When high count follicular units are harvested from FUT (strip surgery) or FUE (individual follicular unit harvest) they can be further surgically separated to provide the hair restoration surgeon with smaller follicular units to create a soft hairline. Follicular units found on the rest of the body and not on the scalp tend to contain 1-2 hairs. Hair follicles tend to grow in group of 1-3, with rare follicles containing up to 5. Hair does not continuously grow; rather it is on a long cycle (Figure 3). The cycle consists 3 distinct phases; growth phase, shedding, and resting (without hair). When you look at the scalp about 85% of follicles are growing hair while ~15% are in a combination resting (with or without hair) or shedding (1). The growing to shedding cycle takes about 10 years which allows hair to grow long. Variation exists between individuals in how long their hair cycle takes. Hair grows about 1.3 cm per month on average (2). Person to person variation between the length of the hair growth cycle and the speed of hair growth determine maximum length a person’s hair can reach. Medical professionals use some specific terminology to refer to the steps of the growth cycle. When the follicle is growing it is said to be in the anagen phase. When the hair follicle stops growing it is in the catagen phase. The next phase is early telogen, where the hair prepares to follow out. Once the hair falls out the follicle rests for in the late telogen phase. The signals that drive the hair growth cycle are driven by the communication between the nearby fat and cells in the hair follicle. Intense research is being undertaken to harness the signals that drive the hair cycle to stimulate hair follicles that have stopped cycling. Treatments like fat-derived stem cell transplantation (3) and platelet-rich plasma (PRP) (4) aim to restart the hair growth cycle. 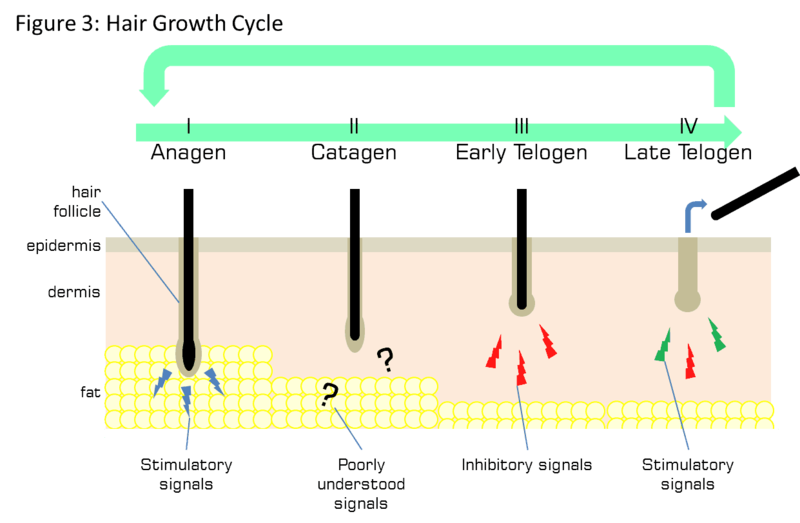 The hair fibre is composed of three primary components (5) (Figure 4A). The innermost section is the medulla whose function is poorly understood. The next layer is the cortex, the thickest layer that contains the majority of the pigment that gives the hair its colour. The hair cuticle is the outermost layer that protects the two inner layers. The hair cuticle is composed of interlocking dead cells that form scales and protection to the hair. 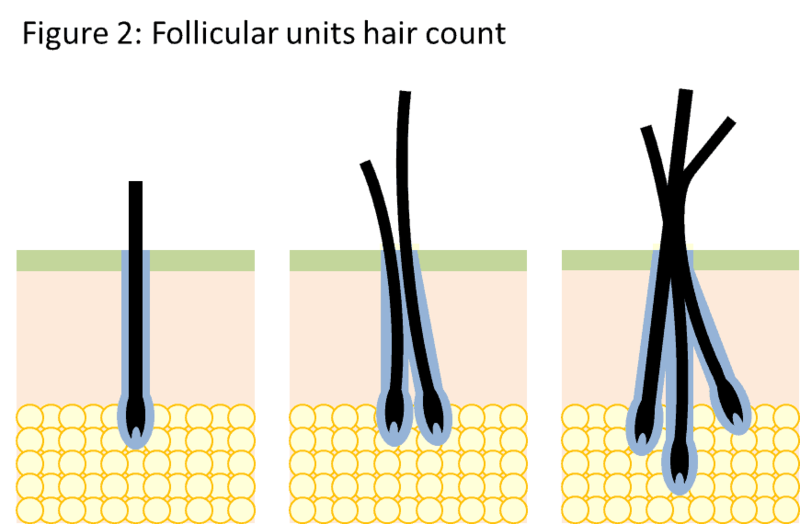 The shape of the follicle determines the curvature of the hair fibre (6,7). 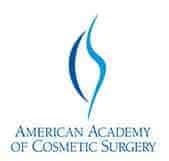 First, the shape of the exit of pore can be circular, elliptical or crescent shaped. A round pore exit results in straight hair while a tight ellipse results in a curly hair. The second way that a follicle influences the hair curl is by the angle or curvature of the follicle beneath the skin. Curly hair grows from a curly follicle and likewise for straight emerging from a straight follicle (7). As the cortex cells grow within the curved follicle they fill the space resulting in longer cells along the outside of the curve (7). Hair curl can be modified by humidity, heat, and chemicals. Temporary treatments involve heating the hair with hair irons. Heating of hair results in changes to the hydrogen bonds in keratin contained in the cortex cells. The heated hair can then be curled or straightened physically by pressing (for straightening) or rolling (for curling). Modification of the hydrogen bond pattern through heat is temporary due to the hair absorbing moisture form the air or absorbing water during washing. Permanent hair curling/straightening requires chemicals that break the disulfide bonds contained within the hair fibre. Disulfide bonds are very strong and require strong bases which can damage the hair and the scalp if used incorrectly. The colour of hair is the combination of two types of melanin molecules: pheomelanin and eumelanin (8) (Figure 4B). Hair ranges in colour from blonde, red, brown to black. Eumelanin provides a black to brown colour while pheomelanin produces a reddish-brown to yellow colour. The ratio of these two pigments results in the vast diversity of hair colours. Grey hair results from the loss of melanocyte cells (pigment producing cells) from the follicle due to age. The subsequent hair is un-pigmented appearing grey or white. Artificially colouring the hair is more popular than ever and can be performed three ways that each result in different level of permanence (9). The cuticle (discussed above) protects the hair from the environment and from absorbing chemicals. Temporary hair dyes are typically large pigment molecules that bind to the rough outside of the cuticle to provide the desired visual effect. Temporary hair dyes can be washed out easily because they do not enter into the hair fibre (i.e., cortex). Semi-permanent hair dyes are usually composed of smaller pigment molecules that become enmeshed in the cuticle but still do not penetrate into the hair. Semi-permanent hair dyes last longer, typically through 4-12 washings. Permanent hair dying involves a two-step chemical process where an oxidizing agent, like hydrogen peroxide, and an alkaline agent, like ammonia are applied to the hair. 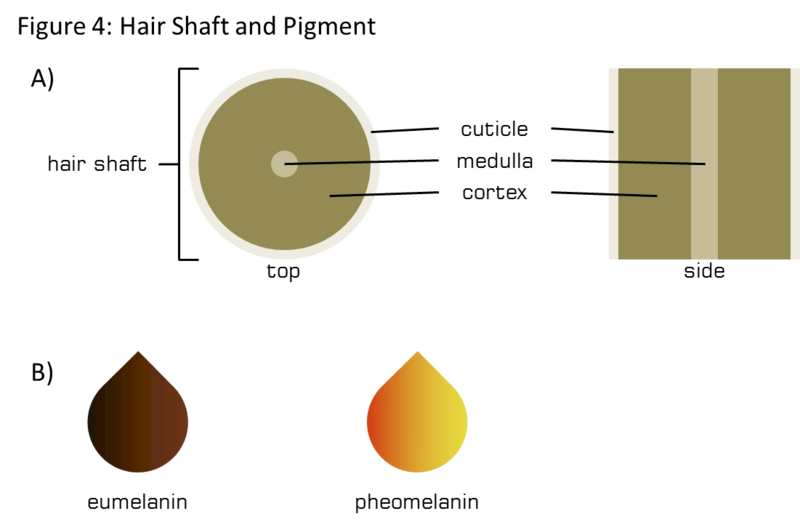 The chemical reaction of the two components causes the hair to swell allowing the penetration of a pigment precursor (dye) as well as the bleaching of the natural pigments. After some time, the dye oxidizes and develops into the desired colour. The new pigment is contained within the cortex which greatly increases the life of the colour (9). The apparent density of hair is influenced by a number of factors. We are born with roughly 100 000 hair follicles, 20 000 of which are located on the scalp. Typically in any given region, roughly half of the follicles can stop producing hair before baldness is noticeable. The implication for hair restoration is that we don’t have to return to the original density to significantly restore appearances. The average follicular unit density is 80 units/cm2 (5). As discussed earlier the follicular unit plays a role in hair density. Greater hair number follicular units provide greater density. Artificial placement of follicular units containing more than 2 hairs right at the hairline produce an unnatural appearance and betray the surgery. Apparent density can also be influenced by the colour of the skin relative to the colour of the hair. When the colour of the skin and the colour of the hair are highly contrasting then the apparent density is reduced; the scalp can “show through” even without any hair loss. Hair caliber (hair diameter) is sometimes underappreciated when considering hair density but it becomes very important to hair restoration surgeons. Thin hair ranges from 30-40 μm, 50-80 μm for medium, and 90-100 μm for thick hair. Hair is so thin that it hardly seems relevant to consider the thickness of an individual hair fibre; however, a person with 85 units/cm2 with a hair thickness of 30 μm has roughly half the hair mass of someone with 50 units/cm2 with a hair thickness of 100 μm. The hair restoration surgeon will measure your hair caliber and follicular density to determine a plan right for you. Hair density is lost initially by miniaturization of the follicle resulting in it only being able to produce a vellus hair. Vellus hairs are small, unpigmented, and do not contribute to overall hair density. Normal hairs are called terminal hairs. The most common form of hair loss is androgenetic alopecia. It occurs in men and women, affecting each in a distinct pattern. In women, the hair loss is diffuse and this is called female pattern baldness (FPB). In men, androgenetic alopecia appears in the typical male pattern baldness (MPB). MPB causes the hairline to recede and for the hair to fall from the crown of the head. In advanced cases, the hair loss of the crown and the hairline meet. 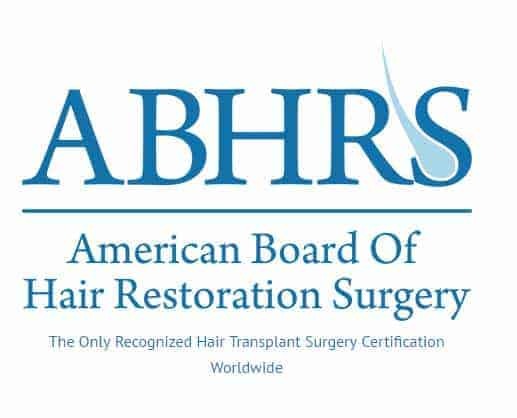 Through years of observation of MPB, hair restoration surgeons have determined that hair on the back of the head is nearly always permanent in the absence of aggravating immune disease. Hair harvested from this region either through FUT or FUE remains healthy and permanent and doesn’t follow the same pattern of hair loss of hair in the hairline or in the crown. Androgenetic alopecia is the medical name for patterned hair loss experienced by men and woman. In men the hair loss follows a distinct pattern where the hair line recedes and the crown begins to thin. Female pattern hair loss typically presents as a diffuse thinning of the hair located on the crown. With androgenetic alopecia the follicle stops producing a terminal, pigmented, hair. The follicle instead miniaturizes and produced vellus hairs that are short soft and non-pigmented (1). Androgens, specifically the hormone 5α-dihydroxytestosterone (testosterone, DHT), are partially metabolized by the hair root sheath. Pharmacological treatments like finasteride, that block the metabolism of DHT, have been shown to prevent and somewhat reverse hair loss. The reason for the follicle to respond to the DHT miniaturizing is not fully understood. Minoxidil has also been successful in treating androgenetic alopecia (1). 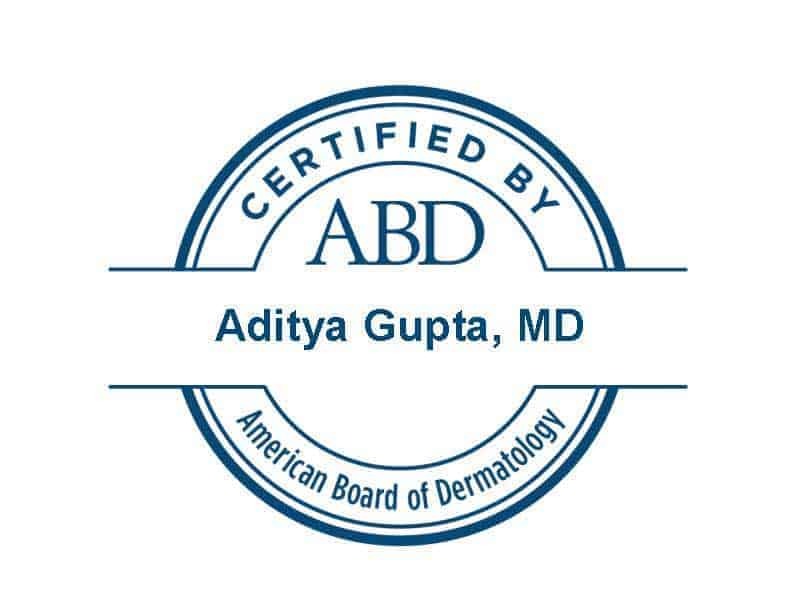 Alopecia areata is the term used to describe a common form auto-immune related hair loss. In patients with alopecia areata, the immune system attacks the hair follicle for unknown reasons. It typically presents as small patchy hair loss. In more severe cases all of the scalp hair may be lost (alopecia totalis) or the hair of the entire body (alopecia universalis); though each of these instances is rare. Alopecia may be temporary if mild, with consecutive fall and regrowth cycles, of permanent with more severe cases. Treatment involves suppressing the immune system with corticosteroids or by using minoxidil (1,10). 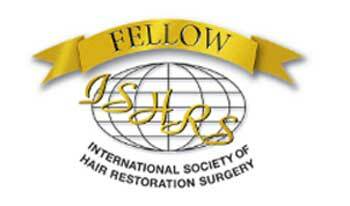 The field of hair care and hair restoration is exciting and changing every day! We hope that this primer on hair helps you better understand your hair and answers some common questions. Feel free to reach out to us if you are considering treating aspects of your hair! We are happy to help. 1. Unger WP, Shapiro R, Unger R, Unger M, editors. Hair Transplantation. 5th ed. Informa Healthcare; 2011. 538 p.
3. Guerrero-Juarez CF, Plikus MV. Emerging nonmetabolic functions of skin fat. Nat Rev Endocrinol. 2018 Mar;14(3):163–73. 4. Alves R, Grimalt R. A Review of Platelet-Rich Plasma: History, Biology, Mechanism of Action, and Classification. Skin Appendage Disord. 2018 Jan;4(1):18–24. 5. Lam SL. Hair Transplant 360. Vol. 1. Jaypee Brothers Medical Publishers (P) LTD; 2011. 7. Plowman JE, Harland DP, Deb-Choudhury S, editors. The Hair Fibre: Proteins, Structure and Development. Springer Nature Singapore Pte Ltd.; 2018. 224 p. (Advances in experimental medicine and Biology; vol. 1054). 8. Ito S, Wakamatsu K. Diversity of human hair pigmentation as studied by chemical analysis of eumelanin and pheomelanin. J Eur Acad Dermatol Venereol JEADV. 2011 Dec;25(12):1369–80. 9. Kim K-H, Kabir E, Jahan SA. The use of personal hair dye and its implications for human health. Environ Int. 2016 May;89–90:222–7.